I ran my first race of the year and finished second. Everything went pretty well, and I had a good time with my buddys. 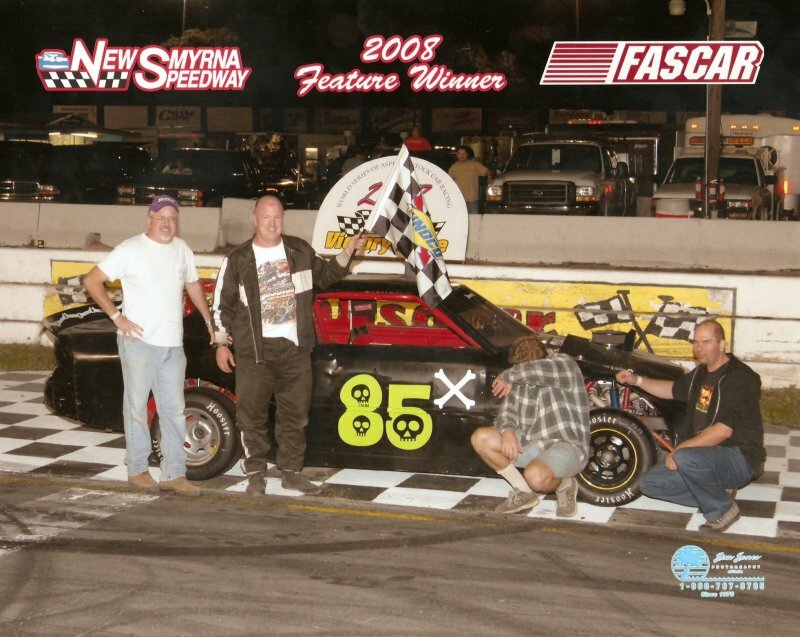 This is not what it looks like, I finished second for the third feature in a row. Ok, so it is not exactly racing, but here is how I've been keeping busy. 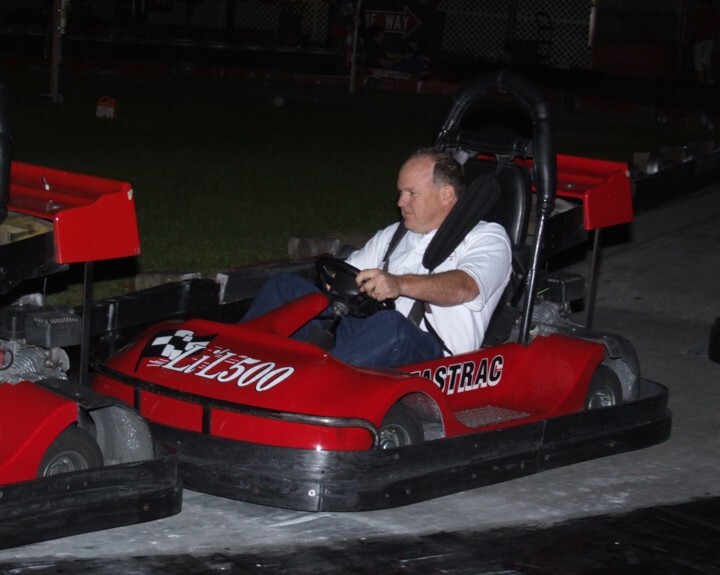 I helped organize a modified reunion during the World Series at New Smyrna, then I had a party at the Lil' 500 for a bunch of racing friends, and I've been repairing the kids go-karts, motorcycles, scooters and jeeps! Now there is another off-season gone and I have not worked on my car.....again! 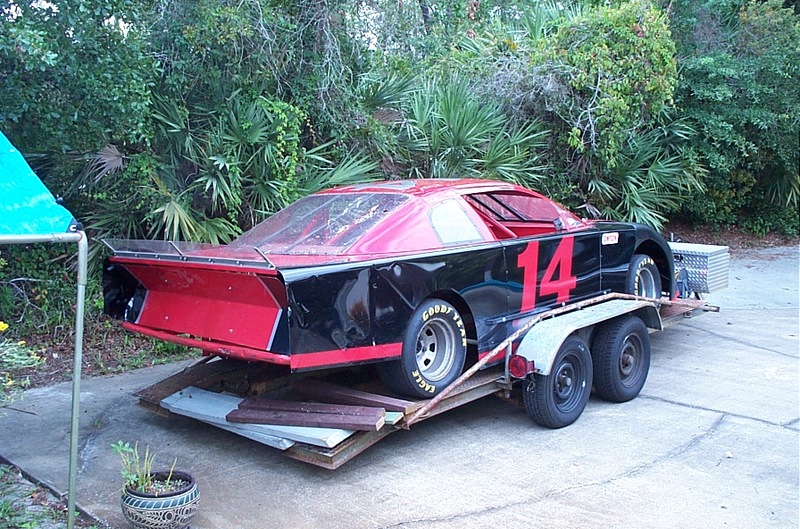 Good news and bad: the bad is that opening night at Orlando Speedworld rained out, but the good is that I had my car ready for the "next" opening night on March 21. Although I didn't get to the track until 8 pm, I still ran second in the heat and feature. That is four second place feature finishes in a row. March 28. I had a persistent push all night. 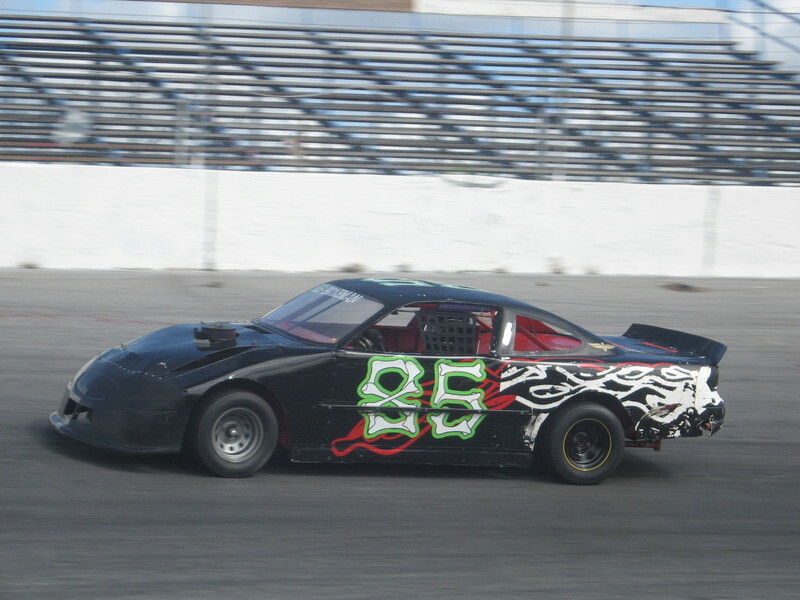 It got a little better for the feature, but was only good enough for 3'rd. Saturday, March 29. This was something different! I had a great time driving Todd McCreary's "Hurricane" at Orlando's Saturday night show. 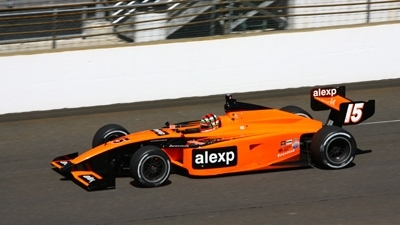 Todd's Probe was a steady winner at the end of last year, so I was lucky to get the chance in such a good car. I ended up third. The first two finishers started on the front row, but I spent most of the race stuck on the back of second place looking for a way around. Friday, April 4. 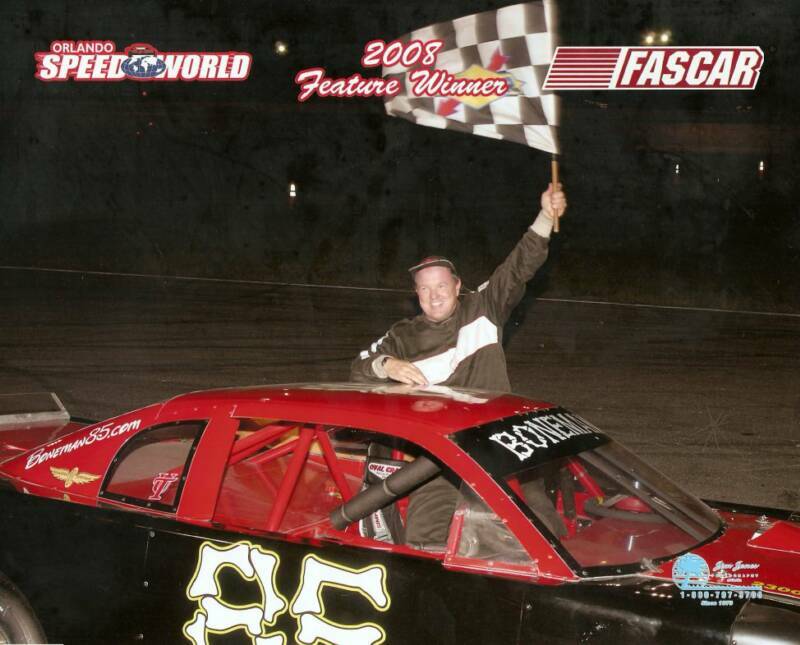 I led the feature for a while, but ended up second again. That is 5 out of the last 6 races. My class is being cherry-picked by the SLM champion who wins every week. I'm not sure why they are wasting their time in mini-stocks, oh well. 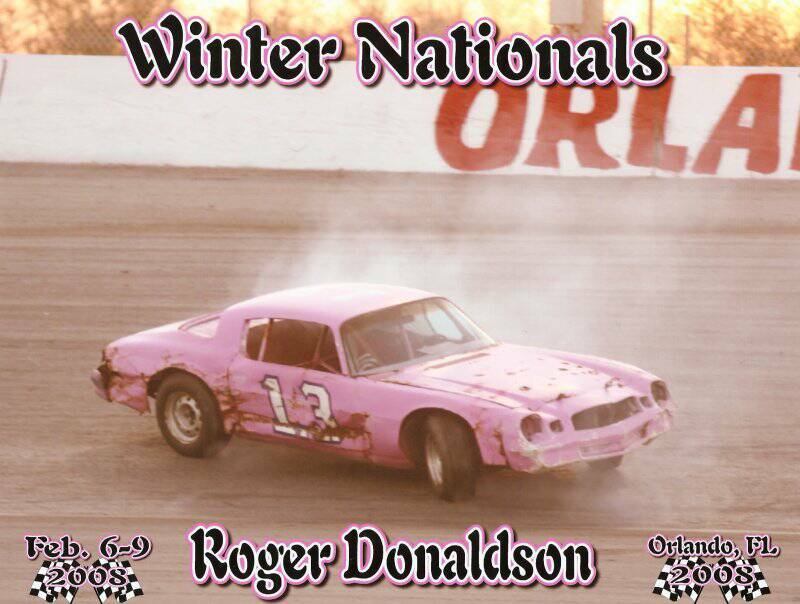 This was my buddy Roger Donaldson during his first time on the track. 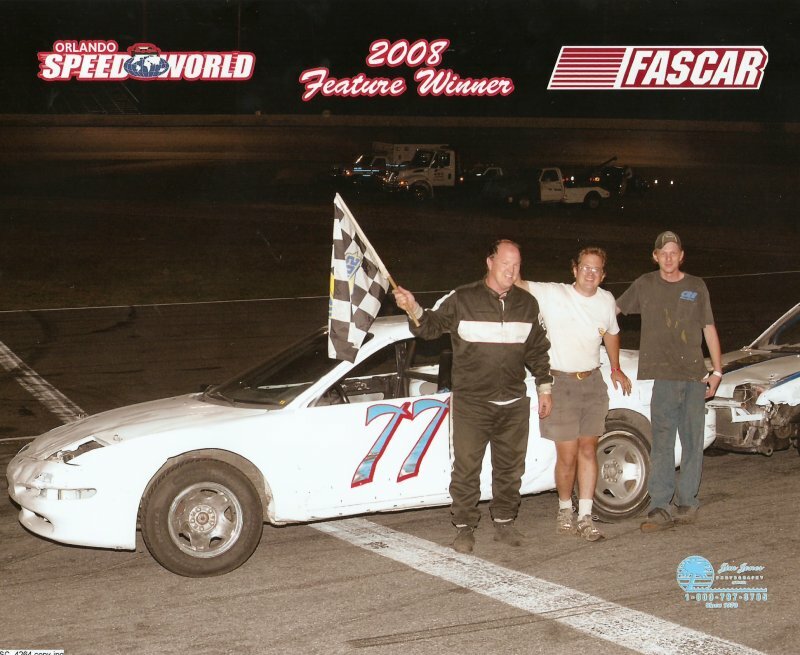 He was driving Ron McCreary's Camaro in the Hurricane class. 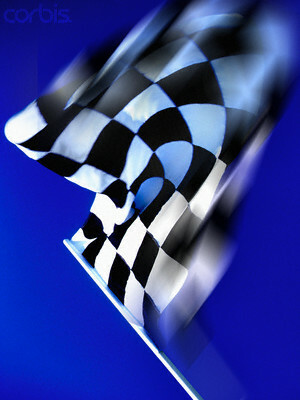 Although he looped it in practice, by the end of the feature Roger was fighting for second! Friday, April 18. Patty and all 4 kids came to see me race tonight. The mini stock class was a little stronger than it has been. We had 11 cars, and 6 of them were contenders. My car continues to push, so I ended up second in my heat and 5'th in the feature. Believe it or not, I am on top of the point standings. 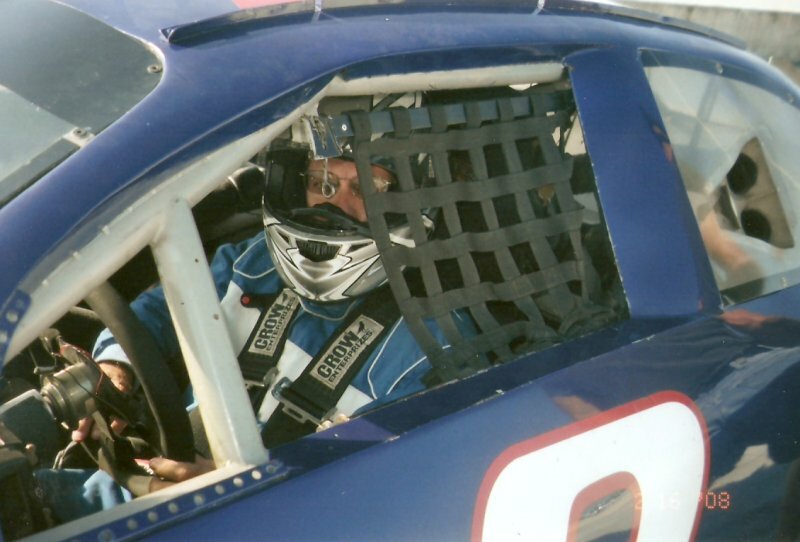 And now for something completely different.... April 21, I traveled to the Punta Gorda area to co-host a racing radio show, "Inside Florida Racing" with KARNAC owner Jack Smith, "Superfan" Carol Wicks and CeCe Brooks, a radio veteran turned race fan. I was invited to fill in for Rob "Bonehead" Elting who was on his honeymoon. We did two hours of live racing discussion with several call-in guests. I had a great time! Thanks for giving me the chance to be the fill-in trainee for a night. The show is always available on a pod cast version. Find it by clicking this link Inside Florida Racing. Friday, April 25. Feature win #23! 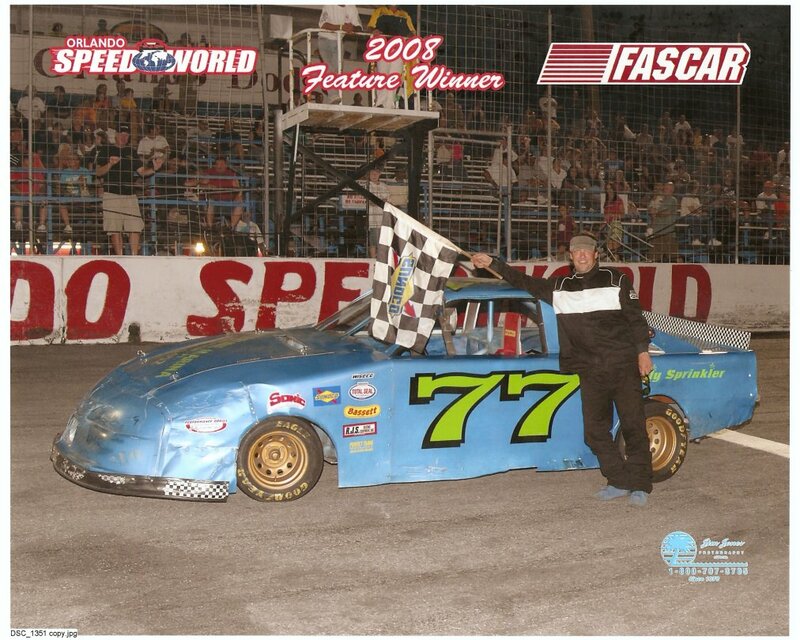 I finally got one, and it came behind the wheel of Todd McCreary's #77 Strictly Stock. I had a hectic week and couldn't work on my car, so I didn't bring it and lost the point lead. Todd offered me a chance in his Ford Probe, and we had a good old time. 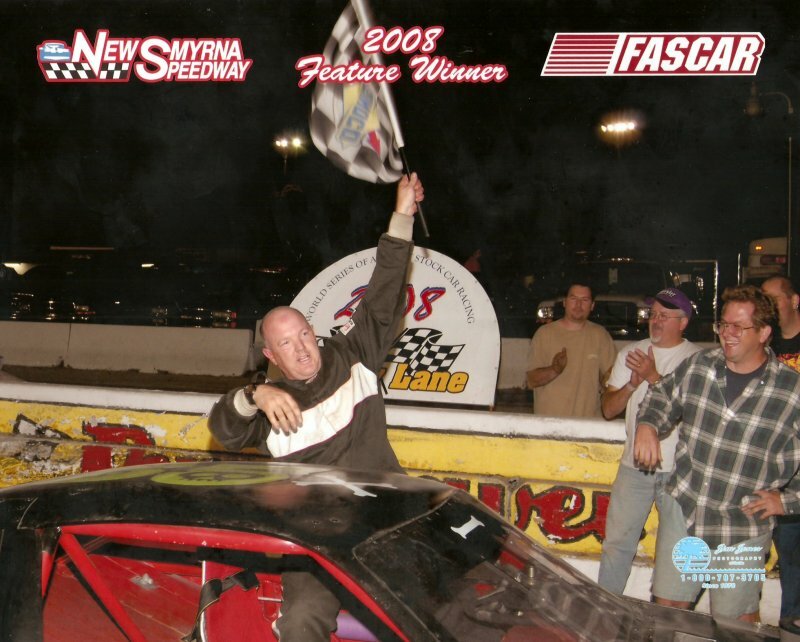 Although it was win #23, several years had passed since the last one! Saturday, May 3. We raced the electric car today and dominated both races. Our car was nearly trouble free for the whole event. That is three wins in a row out of the four races we have entered. This is victory #6 as a car owner. 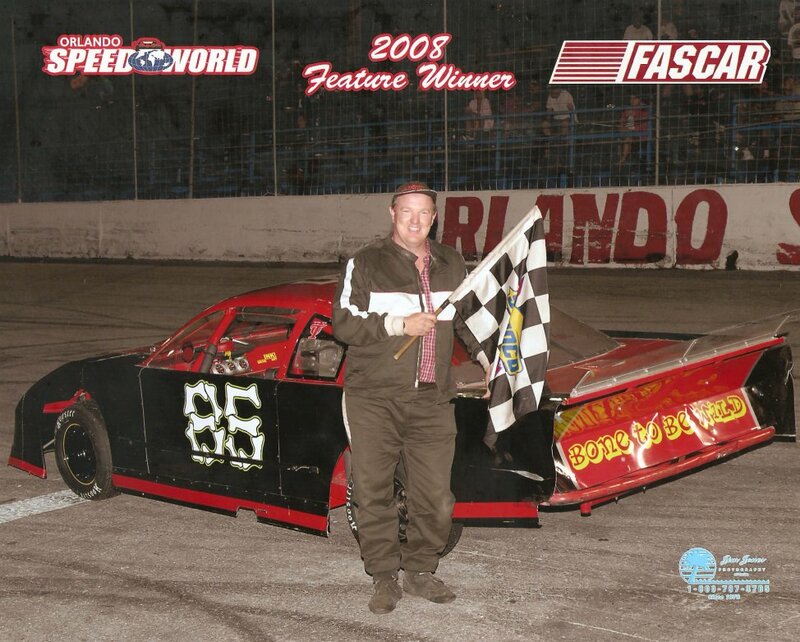 2-16-08 I ran 26 laps around the 3/4 mile USA Speeway in Lakeland in a worn out Cup car. 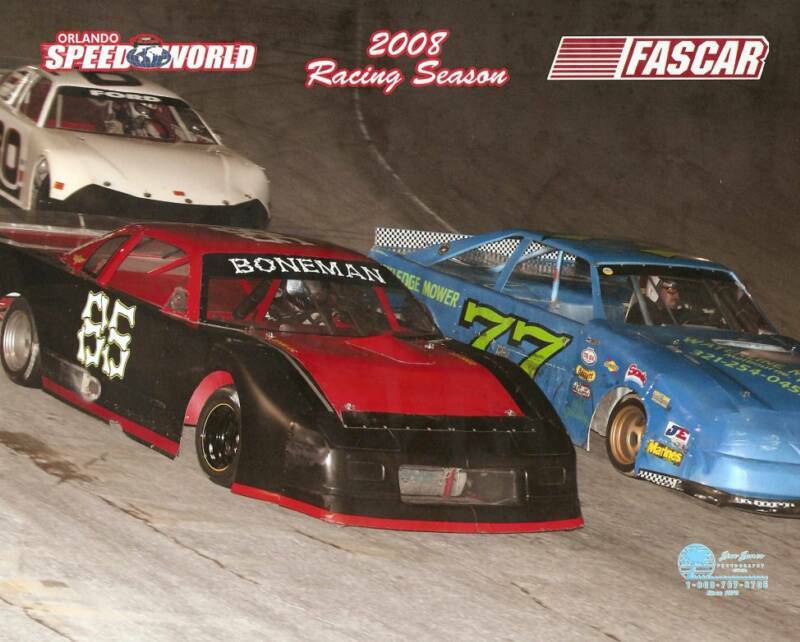 That is me in the red 8, and my buddy Jerry "Frasson118" Binner was in the blue 2. 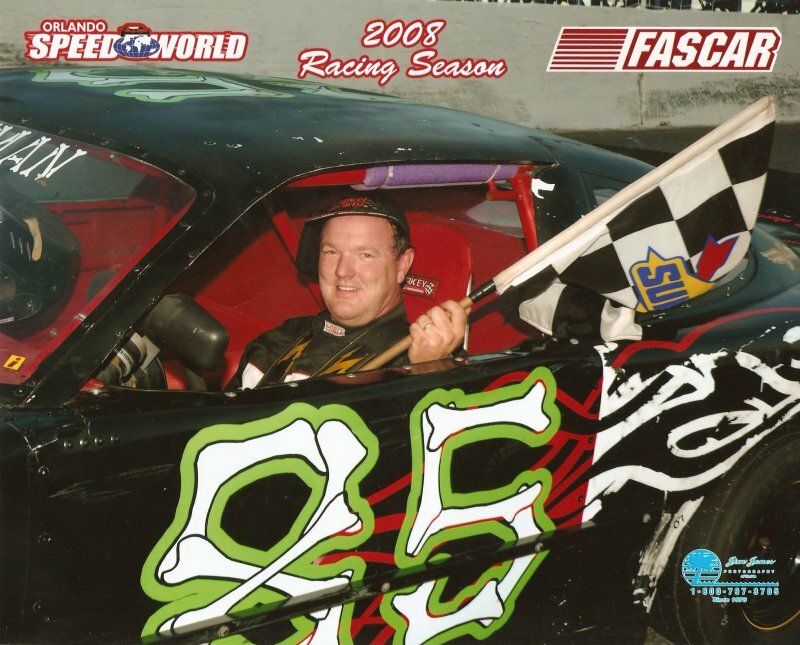 It was his first time behind the wheel of any racecar! Jerry had a blast, and so did my other friends Fred (who also had never driven) and "the Pineknot" Tom Rose. I made my first trip to Indianapolis for some action on Memorial Day. 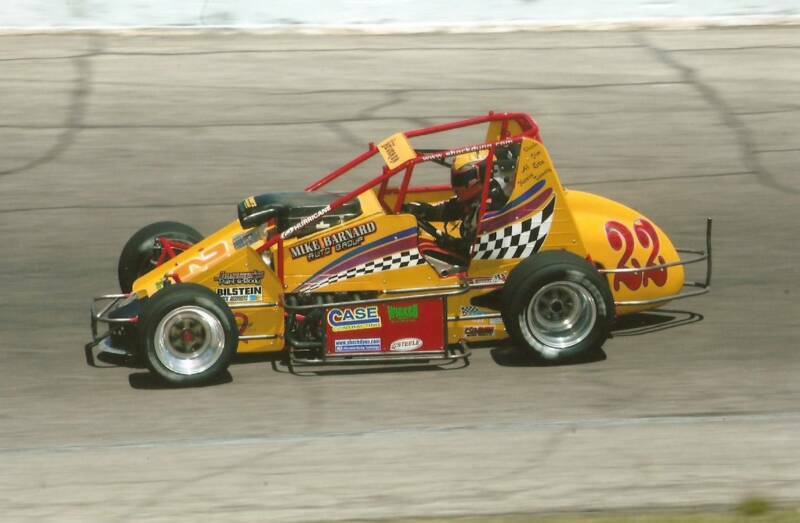 Family friend Don Heckman took his #22 sprinter to the "Little 500" at Anderson Speedway. It was driven this weekend by Doug Heveron. Both Don and Doug retired from competition after this race. 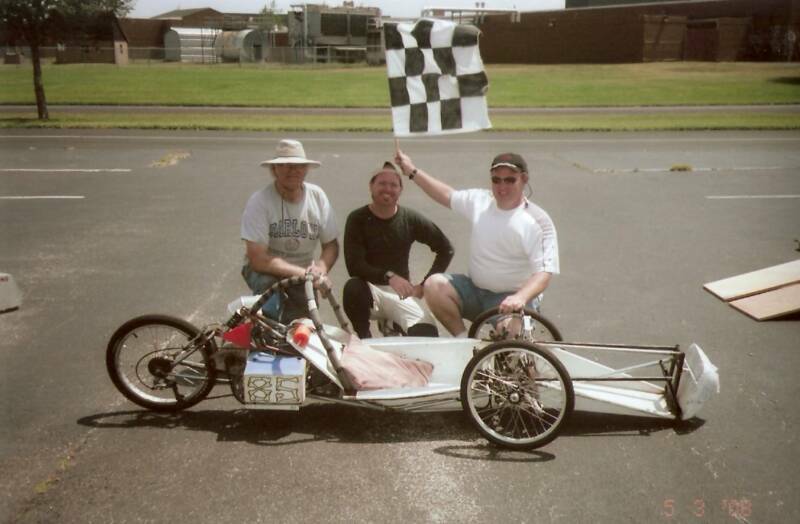 My brother David provided the engine for the 500 lapper around Anderson's 1/4 mile oval, and my dad was one of the sponsors. The team set fast time and started on the pole, but got caught up in a crash on lap 99 which ended their night. My dad and I also made a trip to The Speedway on the day before the Indy 500. We saw the 100 mile Indy Lights race and had a blast. 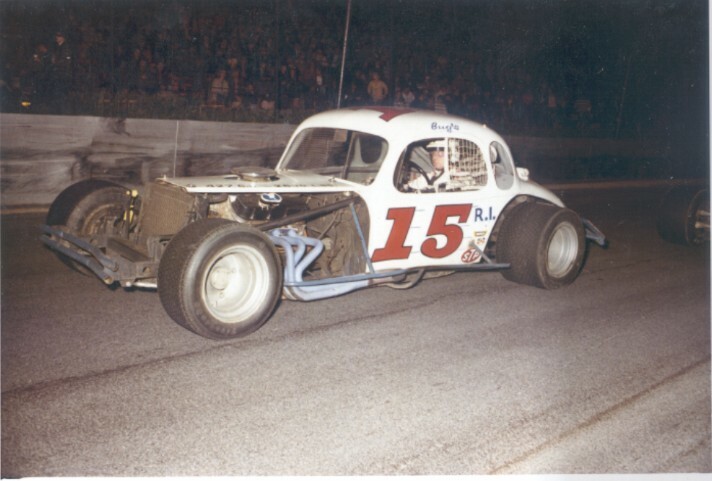 Race winner Dillon Battistini is shown in the #15. June 6. 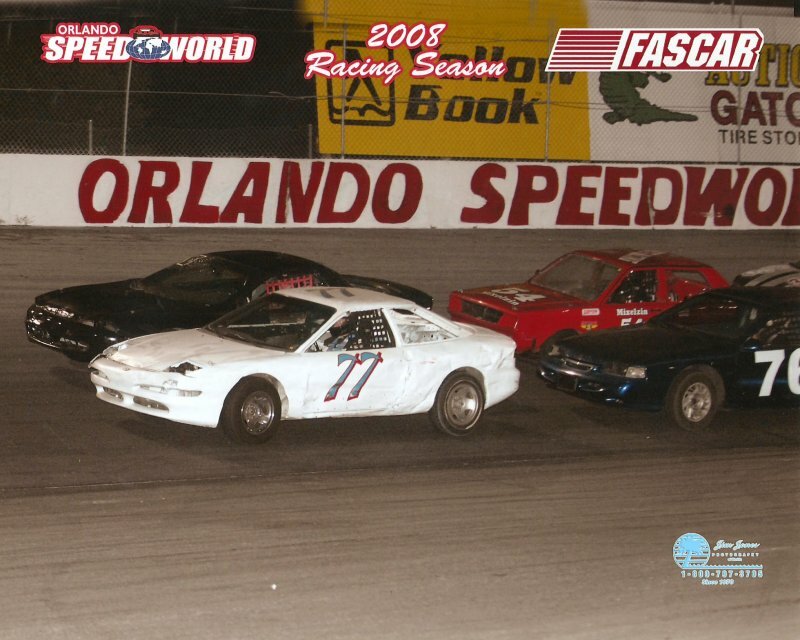 I ran second again at Orlando. 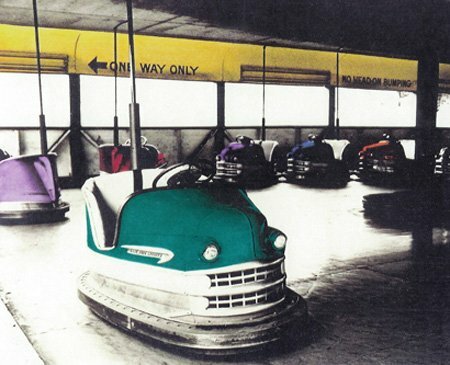 My car was quicker and I had a good old time. 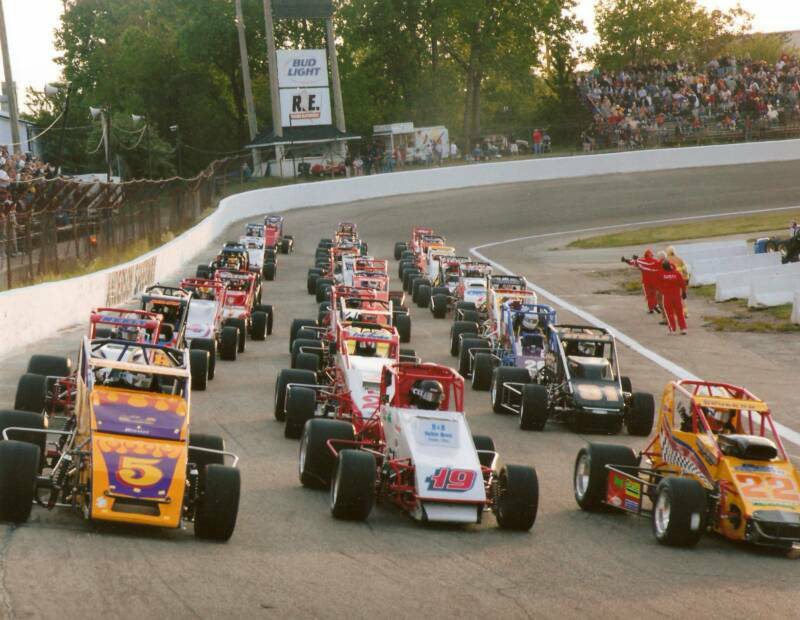 Sprint cars were on the program....man I gotta try one in a race one day. July 11. Central Florida has been battling rain-outs! 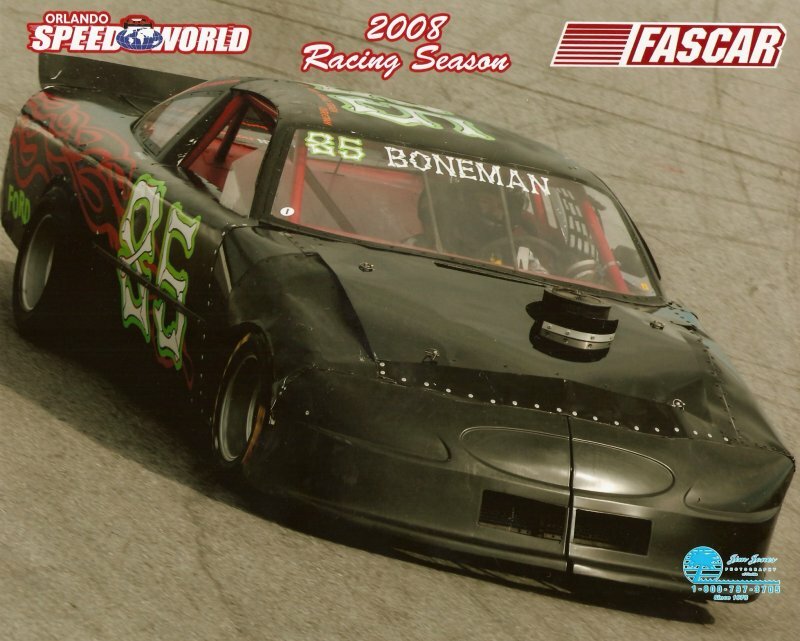 After Orlando flooded last night, I left the car on the trailer and raced at New Smyrna. It was my first time there in 2 years. This was just a joy ride because I didn't prepare the car with the correct gear, but I still finished 5'th. I was surprised that I was ahead of anybody! July 25. 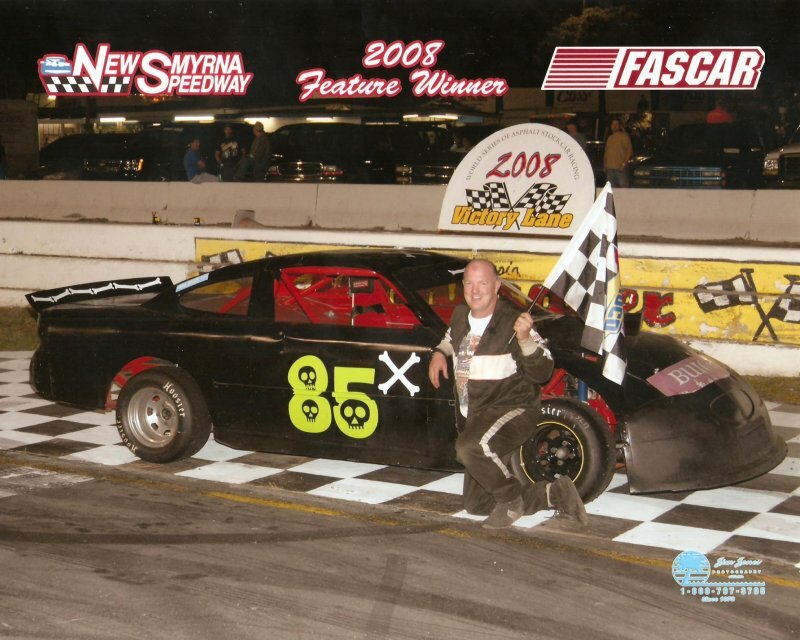 While on vacation with my family, I learned that my friend Randy Blakeslee won his first mini stock feature. Great news! I wish I had been there! August 1. Oh boy, one of those nights. 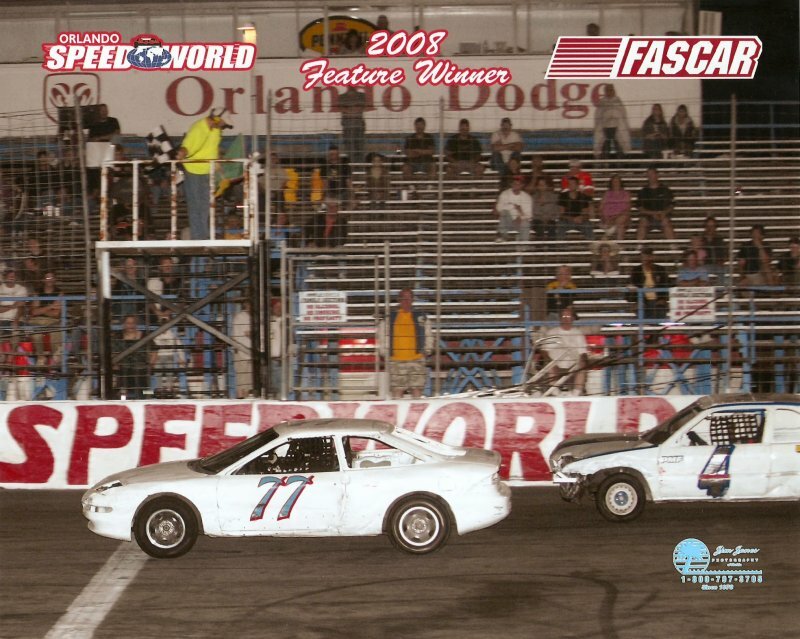 I won the heat race, and was leading the feature with three laps to go. I had it won.....until the throttle hung open and I hit the wall. 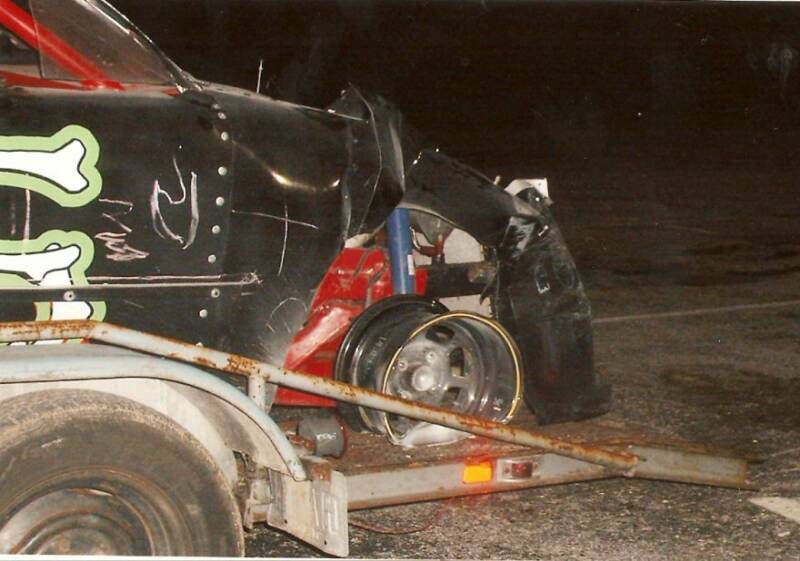 Any racecar damage can be fixed, but sometimes there is a point where it is not worth it. 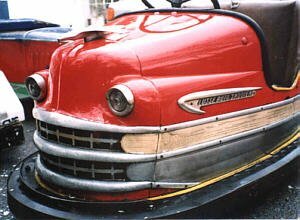 My car needs a front half, so at this time it is not likely that I will repair it. This car is 13-14 years old anyway, and has repairs on top of repairs. 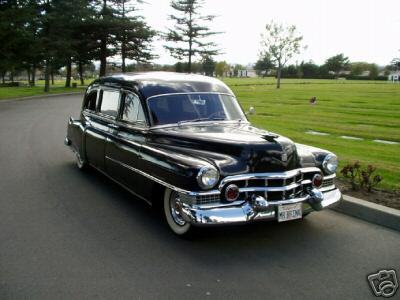 Besides--- I bought another car anyway! Everything combined to make this one of the most fun racetrack nights I've ever had. 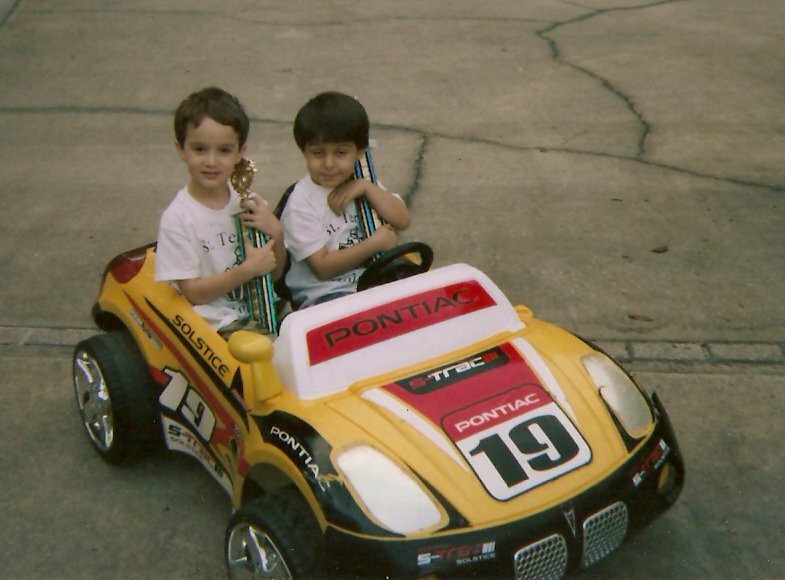 This was the first time I drove my new racecar. This was taken during the heat race where. I spent the first 5 laps getting around Randy, then I got to work on the leader. 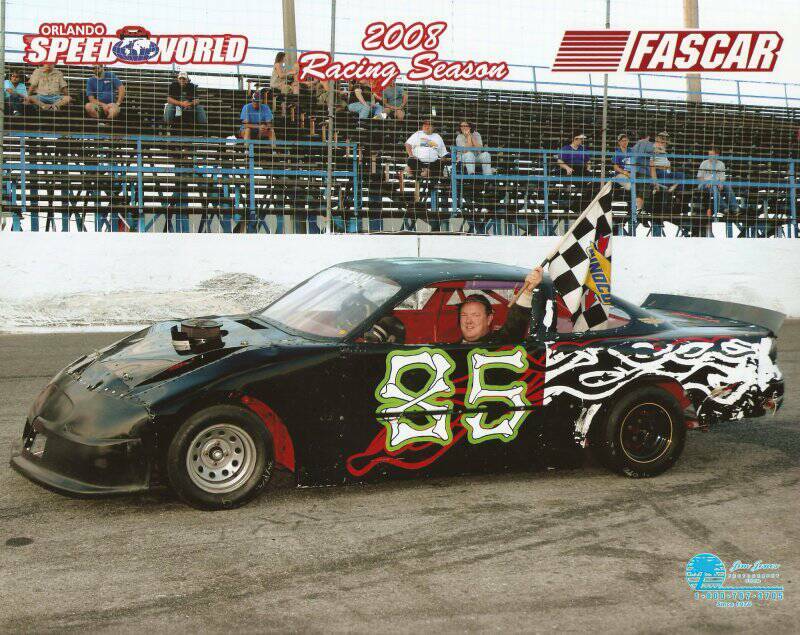 We ended up drag racing to the line and he won by a foot. Of course winning is great, but when you are surrounded by a bunch of friends at the same time, well it makes for a darn entertaining evening. After the races, we stood around watching the race videos, maybe tasted a few beers, and cracked about a million jokes. Then 6 of us went to the IHOP for the loudest and most rowdy dinner that I have ever been to. A perfect night! 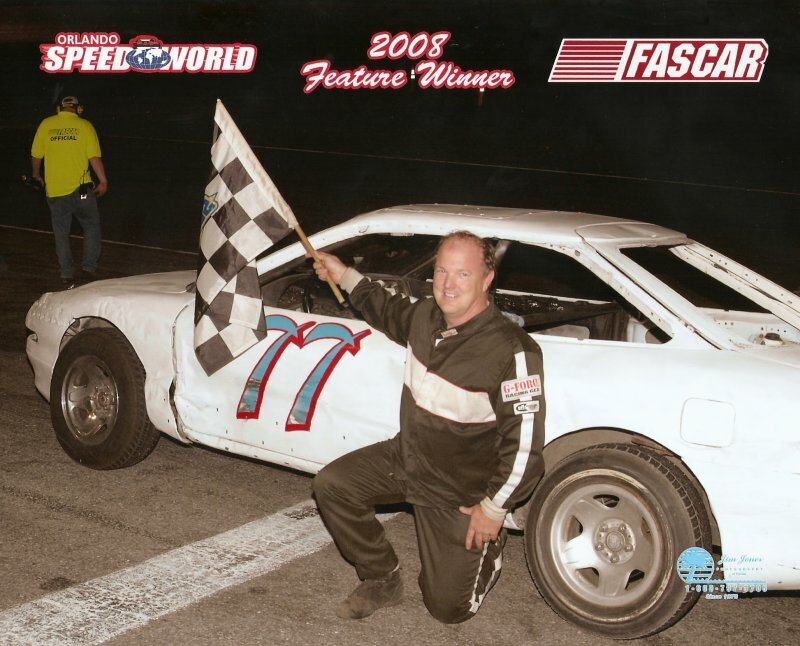 Two post-scripts: the last time Jim Robinson showed up was the night I won in Strictly Stocks. He was here again tonight, so Jim is my official good luck charm. Also, I came face to face with an old friend, Vaughn Rockney, for the first time since 1974! All things considered, it was one hell of a night. Ok, this was a first. 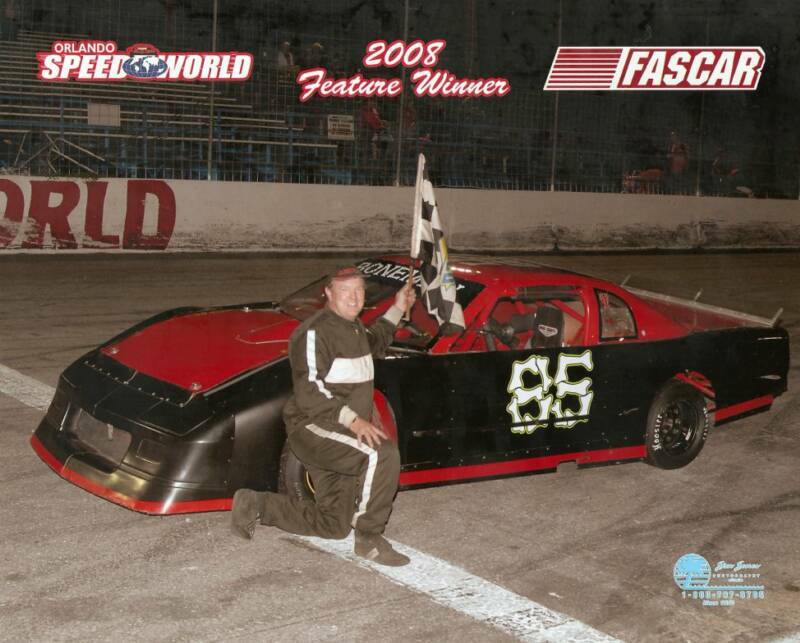 Todd McCreary drove my old car tonight. I had planned on taking the new one also, but something came up and I had to go out of town for the day. This was the first time someone has driven my car and I didn't even see it. For the record, Todd started 10'th, finished 5'th and didn't put a mark on it. . 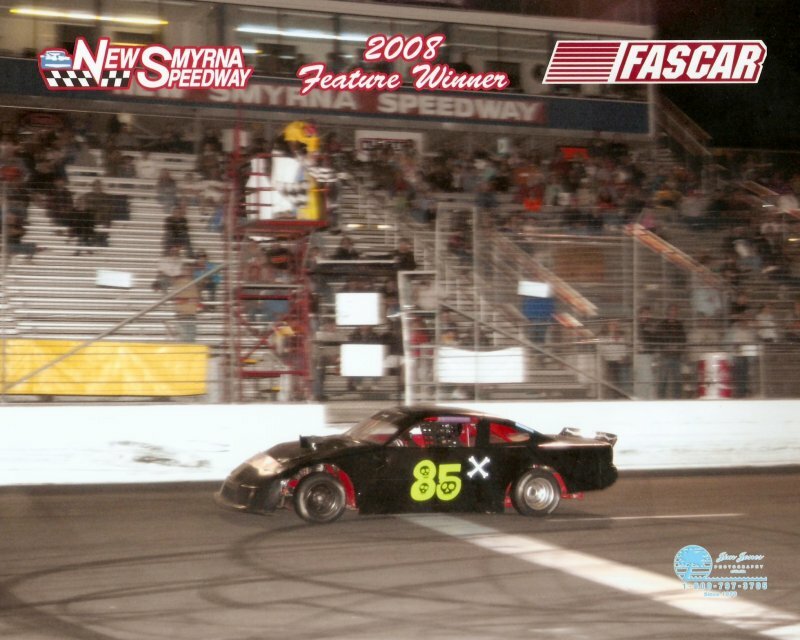 This was my first win at New Smyrna Speedway. 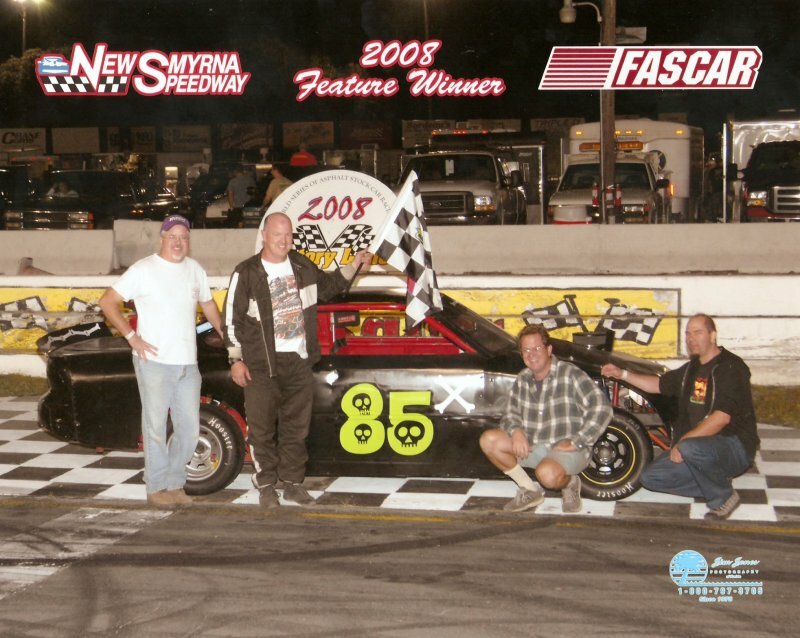 I took the old car to New Smyrna and ended up winning. After spending the whole day working on it, 85X was finished just before to race time. 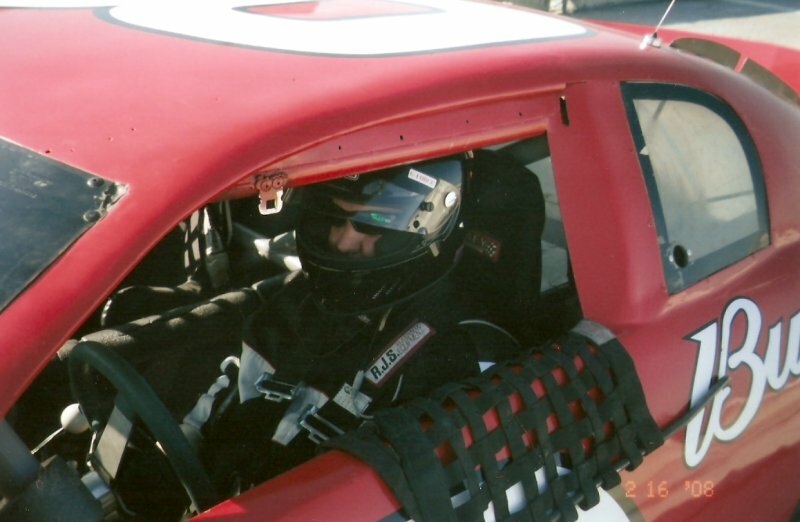 I had no practice and no heat race, but everything worked right the first time. It was also the night of the Hialeah Speedway reunion, so it was cool to see some of old friends there. We had a great celebration dinner at Dennys! There were 16 of us. Home at 3:30....another excellent night! In the picture to the left, you will notice that Todd was overcome with emotion. Yes, he had to weep, then he felt better! 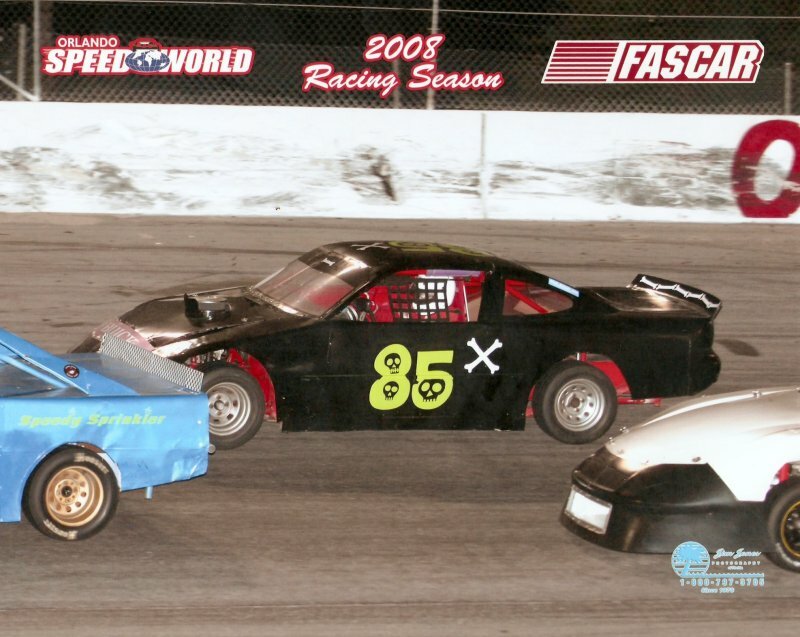 Also in the shot are racing buddys is Mike Poole (left), on "Derf" (right). 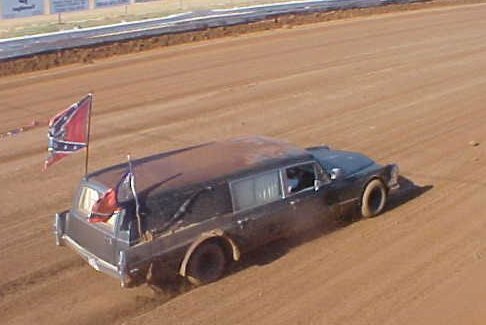 Good news: Todd drove 85X to a second place finish in the feature. Bad news: I burned up the clutch in my car on the pace lap and was credited with last! 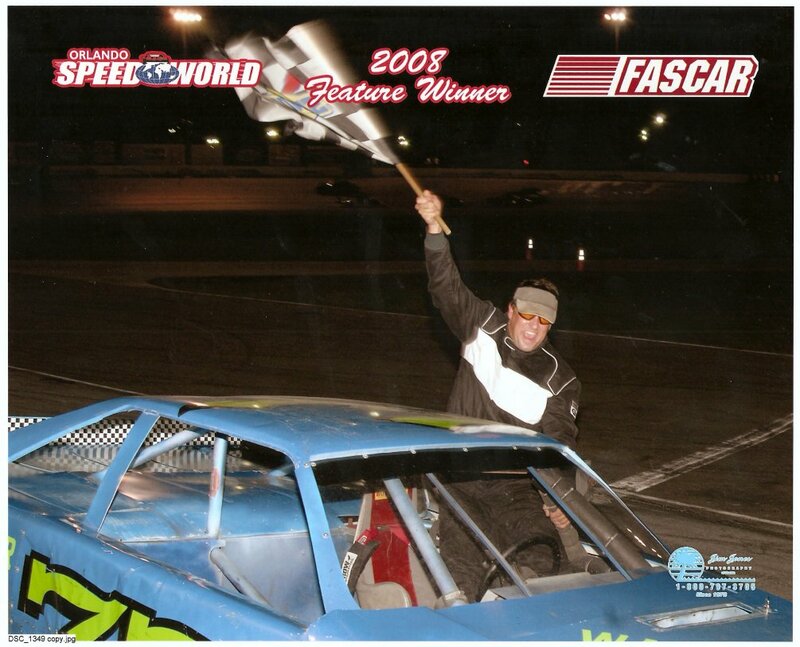 Well, that does it for racing in 2008! I ran 14 nights and got 3 wins, 5 seconds and 12 top 5 finishes. There was also a win as a car owner in the Electrathon race. In all, a pretty good year, and most importantly it was a lot of fun. I am sure I had some stress and aggravation along the way, but I don't remember it. Its been pushed out of the way by the good stuff. On to 2009! Here is a different way to end the year. 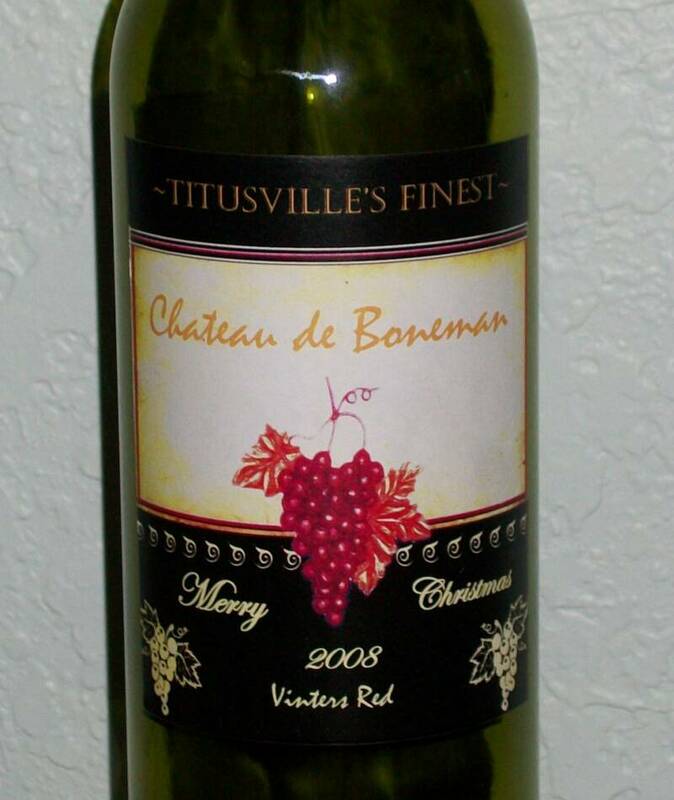 I gave away 4 cases of red wine at Christmas, "Chateau de Boneman"; from the finest wine cellers in Titusville! 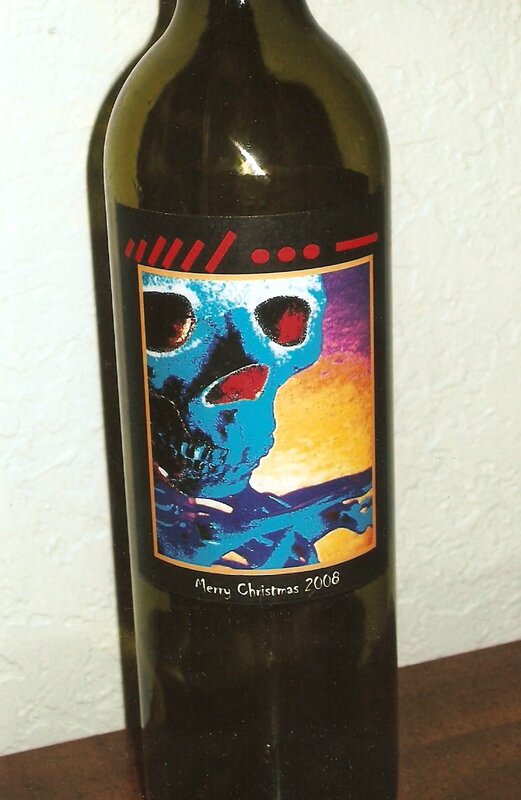 I have some every night, so I thought it would make a cool Christmas gift. No, I didn't made it. It just has my labels on it.